As of today, the PDGA Website has Ricky Wysocki’s player rating at a whopping 1047- and to this point, it is the highest held rating ever. In 2013’s second National Tour event, The Texas State Championships, Ricky Wysocki crushed it. His first round score was the best of the day by a couple of strokes, and at this point he was only getting started. The second day had Ricky throwing a sub-60, 1092 rated 59 and pulling away from the rest of his competition. In the end he won the N.T. by a full ten strokes over 2nd place. Just two weeks later, he played another Texas event, the “Dusk til Dawn Open” in Leander, TX. This was a B-tier tournament with six other 1000+ rated golfers besides Wysocki. His Prodigy teammate Jeremy “Big Jerm” Koling shot a blazing 1074 rated 48 stroke round on the second day with a -17 down (on 19 holes). Not being on the same card as Wysocki, Koling thought he had the course record with that score. However, Wysocki had managed to throw a 1083 rated 47, which was -18 down. At the end of the final round, Ricky was nine strokes ahead of the competition. 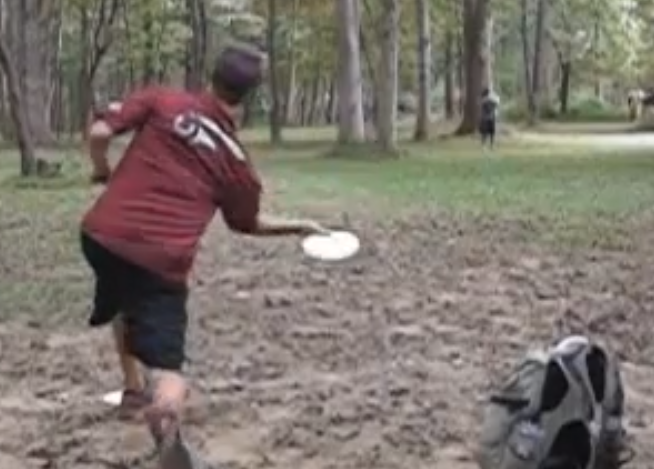 So the pattern has been set for Wysocki in 2013: crush and keep crushing. His aggressive and accurate putting style seems to give him the ability to “pour” the disc into the basket after errant drives and/or unreachable birdies. His back-hand drives have plenty of power and distance, but his forehand drive is what gives him a distinct advantage by essentially allowing him to play ambidextrous. Not only can he put a sidearm shot over 400 feet away; he simply has natural form. With good form comes endurance, and from the outside it sure looks like his arm is healthy (the shoulder and elbow especially). I would have to guess that Ricky played baseball growing up, or at the very least did a lot of throwing. All of this ability seems to be clicking for him in the last year+ of professional disc golfing. Two summers ago he tied for 2nd at the Am Worlds behind Wiggins Jr. but now he’s proven himself to be one of the top 3-4 players in the world. This entry was posted in Touring Pros and tagged disc, dominate, golf, national, NT, ricky, tour, wysocki. Bookmark the permalink.